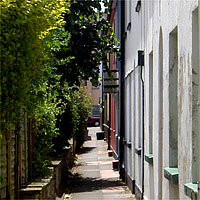 This is a twitten, a Sussex word for alleyway. It’s almost like a rural lane, with trees hanging over the front gardens. This is a fossilised landscape. Brighton’s mediaeval fields determined the shape of these streets. The fields were tiny parallel strips of land, like pencils in a box. When the Old Town expanded, builders bought up the narrow fields. There is a public walkway between the front doors and front gardens of Trafalgar Terrace. The houses were built on one narrow strip of land. Another strip was probably acquired for the front gardens. The ancient field boundary has become a pathway. My great grandfather, Samuel Harris, is shown on the 1871 census lodging at 12 Trafalgar Terrace with his brother John. They had come up from Cornwall. On a recent visit from Kent I have just discovered the alleyway. What a treasure. Interesting to hear on this site the gardens would have been “normal” front gardens in 1871.